Students will be able to make inferences independently to deepen comprehension skills. Teacher plays a clip from America's Funniest Home Videos and periodically stops the video and asks the students the following questions. • What can you infer from that lingering shot on __________? • What can you infer from the sounds in the video? Happy? Sad? Scary? etc. • What can we infer from the character’s facial expression? 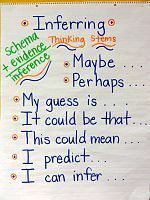 • Using your schema what can you infer? o Do you have any similar experiences? o Have you heard anything that sounds like that? Students watch the clip and make inferences as teacher prompts. Teacher begins a mini lesson about making inferences. Teacher shares a read aloud with the group. Stopping along the way for students to turn and talk about the inferences they are making. Students make inferences about the read aloud in pairs. Students have more opportunities to practice inferring by using the app called Inference Ace. Here they are given a few short story lines and four multiple choice answers. Example: Julie walks in her room and switches off her night light. Can you guess what is happening in this sentence? Students should be able to infer Julie is going to bed. 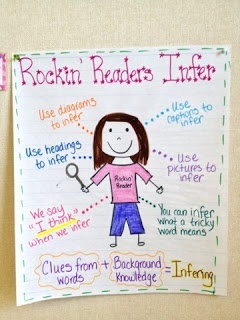 Teacher assesses student's ability to infer. Students share pros and cons in a group of 4 about using Inference Ace.